We want to get healthier. While weight loss is a part of this, health is a whole body issue. Less stress can also make you healthier. We want to get out of debt, manage money better, and make more income in our spare time. So how are we planning on achieving these goals? 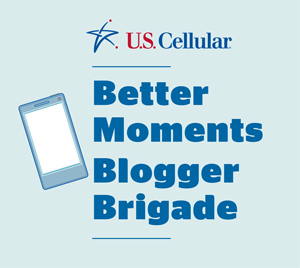 Our mobile devices from U.S. Cellular can certainly help. To stay in touch with family who are spread across the country and around the world, we both have Skype downloaded on our iPad Airs. It doesn't matter if you are wanting to talk to someone in the next state or in Russia, you can set a time to talk and you can talk to that person for free with the Skype app. An added bonus is you can see that person as well. When my boyfriend and I were not living in the same state, we used the Skype app nightly to be able to stay in touch with each other. Now we are using it to stay in touch with family and there's still some close friends of mine who don't live nearby who have yet to meet him. We are planning on Skyping soon with a close friend of mine who lives in Russia. Such a wonderful app to bring everyone together. In fact, my friend who lives in Russia, sometimes his family who lives in Maryland will set up an iPad and let them view the family get together via Skype. Technology allows better moments for everyone near and far! To become healthier, there's a few apps we are relying on. One is MyFitnessPal. I've been using this one since I learned about it when I went to a weight loss week in May. It can track your calories eaten for the day, and you can set it up to show you how many grams of fat, protein, carbs, etc. you have eaten. I didn't realize until I went to this fitness week that you NEED a certain amount of fat in your diet to lose weight. I had been buying all fat free food items and therefore was inadvertently making myself not lose as much weight as I could have been with the same effort. Who knew? I didn't! In addition, if you have a blog you can get a great little button to put on your blog saying how much weight you have lost. (You can see mine on the right side of this blog.) You can also track your exercise in MyFitnessPal and it will give you an approximate number of calories burned based on your activity when compared to your height and weight! Another app that I learned about when I was at camp and I want to use more often is Fooducate. I downloaded this into my U.S. Cellular Samsung Galaxy S4 and it's a great resource to decide which is the healthier choice of foods. When in the grocery store, just scan the bar code of a food you are considering buying with your phone and it will give it a rating. It analyzes calories to nutrition, if there are GMOs in the food, etc. If it is a C or D rating, it will give you suggestions of similar but healthier products you can purchase. To help encourage my boyfriend and me to be out and about, I have the Geocaching app. (This one is $9.99 in the Google Play or app store, but the others I mention in this post are free.) Geocaching is like a treasure hunt. People have hidden small containers around the world, and you use GPS coordinates to find them. It's a fun way to get outdoors! Also, when you need to fill prescriptions, check to see if your pharmacy has an app. Ours does and I can scan a barcode on my prescription bottle and it will be ready to be picked up when I go into town. That way I don't forget to fill my prescriptions and that means staying healthier! Another way of staying healthy is eliminating stress. An app I just downloaded to help with that is Evernote. It can help keep you organized, help you know when you have appointments (and with trying to keep tabs on schedules for myself, helping my boyfriend remember things, and keeping track of my mother's doctor appointments, just keeping an organized calendar is a huge stress reliever because I can pull out my tablet and tell a receptionist "We have a doctor's appointment then, but what about the next day at the same time?" Finances? Be sure and check out your bank's app. At my bank, we can even make a mobile deposit by snapping a photo of the check with our mobile device. It's quick and easy! I can download the eBay or Amazon apps if I want to sell something online. Plus I can keep everything organized in the Mint app. I can see how much I have in my bank account, track spending, and create budgets. As you can see, there's a lot I would like to accomplish this year, and I'm glad I have a mobile device through U.S. Cellular to help me get healthier, get my finances on track, and to stay in touch with family. How did people achieve New Year's resolutions (or achieve goals) before we had cell phones? What are your resolutions and what apps are you utilizing to help you achieve those goals? I give you a lot of credit for using all these apps! I don't have the technology right now to be concerned about it, but hopefully some day I will! !